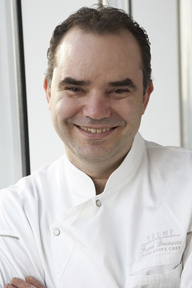 Australian Executive Chef Frank Brunacci of Sixteen at Trump International Hotel & Tower Chicago knew at a young age that he wanted to be a chef; dedication and determination, along with a creative spirit have helped him achieve his goal and set culinary standards around the world. He graciously shares his signature recipe of Duck Percik. Meeting Executive Chef Frank Brunacci in June 2009 while I was in Chicago was indeed inspiring as his culinary passion literally crackles in the air and his enthusiasm is clearly contagious. He is someone that always knew he wanted to be a chef or an actor. Cooking won his heart, and by the time that he was fourteen years old he was already working in a pizza restaurant, and by the time he was seventeen he was apprenticing as a chef in Melbourne, Australia and attending William Angliss College. Four years later at the age of 21, this intrepid future chef headed to London without a job and only a connection of someone he had apprenticed with who was a sous chef. He showed up, worked in the kitchen for one day with Joel Antunes at Les Saveurs, and decided that this was the food that he wanted to create. Alas, there was no position for him in the kitchen, so he headed to France where he worked for three months learning to speak what he calls "kitchen French" and then returned to London when there was an opening at the restaurant. His "kitchen French" came in handy working at Les Saveurs where 23 out the 24 people working in the kitchen were French. At the age of 24, he returned to Australia where he worked for 2 years as a chef, before receiving a call from Joel Antunes who was moving from London to the Ritz-Carlton, Buckhead in Atlanta, Georgia and wanted him to come and work there as his sous chef. He readily accepted and moved to the United States. He learned a lot there before moving on to the Ritz-Carlton, New Orleans where he was the Chef de Cuisine at Victor's a renowned five-diamond AAA restaurant. 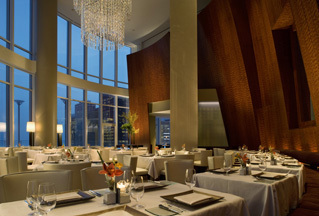 In 2007, he joined Trump International Hotel & Tower Chicago as the Executive Chef and describes the experience as "giving birth" working 20 hours a day to open the fine dining restaurant, Sixteen, in January 2008. Since the restaurant opened, Chef Frank Brunacci and Sixteen have been attracting a loyal following with his innovative cuisine showcased by the dining room's dramatic 35-foot ceiling and a wide wall of windows that provide a commanding view of the Wrigley Building and the Tribune Tower. He feels his success is because of the excellent products he is able to obtain, as well as to his team who have been with him since the beginning. He is a chef that encourages and supports his chefs and is proud of them, and tells them that if you choose this life, then live this life. Since coming to the United States, he has worked and lived in 7 states, and loves working in Chicago, which he feels is on the cutting edge in large part due to Charlie Trotter and the former chefs that worked for Charlie who have now achieved their own recognition. When not working in the kitchen, he enjoys spending time with his wife and two young daughters, ages 2 and 4, loves meeting other chefs and eating in their restaurants, is partial to American football, his favorite team is the Saints, and playing an occasional game of golf. Chef Frank Brunacci graciously shares a delicious taste of Sixteen with his signature recipe for Duck Percik. Method: Rub fleshy side of duck breasts with ginger and garlic. Place in quart size plastic bag or glass dish and refrigerate. Method: Combine all ingredients in blender or food processor and pulse until smooth. Add duck breasts and marinate one hour. Remove duck breasts and sauté 2-3 minutes per side. Place under broiler briefly, skin side up, to brown. Method: In heavy skillet over medium high heat, melt butter and honey and cook until caramelized and thick. Stir in vinegar to deglaze pan. Add zest and coriander. Stir and cook until reduced by half. Add veal stock and cook, without skimming, until reduced to sauce consistency. Method: Bring milk and butter to boil. Add polenta and cook briefly until thick and soft. Add cumin and stir in cheese until melted. Allow mixture to cool slightly before pouring into buttered round mold. Cover and refrigerate until firm, then slice into circles, squares, or diamonds. Presentation: Using a skillet, sauté polenta slices quickly on both sides in clarified butter or olive oil. 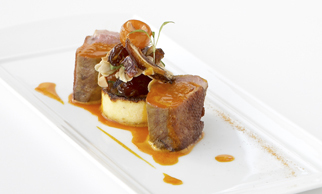 Arrange polenta on plates first, surrounding it with sliced duck breasts. Drizzle with Percik sauce and add garnish of fresh greens. Sixteen is open for lunch Monday - Saturday from 11:30 am - 2:00 pm, for Sunday Brunch from 11:00 am - 3:00 pm, and for dinner Sunday - Thursday from 5:30 pm - 9:30 am, and Friday - Saturday from 5:30 pm - 10:00 pm. Read about Trump International Hotel &Tower Chicago in the Destinations, Hotels and Resorts, Restaurants, and Spas sections. © July 2009. Luxury Experience. www.LuxuryExperience.com. All rights reserved.